I blog about Art, disability, mental health, autism and probably amusing anecdotes. I take too many pictures and I laugh loud. Big Dog lover who now owns a Chihuahua and loves to travel. Expanding rapidly into photography as a way for me to process the world and express myself. Visual thinker and Leo. Liberal and Left with a love of science. I am simply unequivocal. Hopefully, I will eventually have failed enough that something works, something sticks and that I can make a career, or rather part of a career, out of something that I can flex around my various disabilities and health states. It sure would be nice to be independent, one of the biggest struggles of any disabled person. As far as new year new me – like I said, I’ve been sick basically since the beginning of the new year, so not much has happened, aside from a small change in meds. I DID however manage to go and see Harry Potter and the Cursed Child on New Years Eve with one of my best friends. I am going to categorise this as a religious experience, the entire performance was AMAZING, the music by Imogen Heap was totally not what I was expecting and the entire thing nearly blew my tiny little mind. Plus, the theatre were really good at getting me a different seat for the second Act after I’d really struggled in the first. I also bust out my Slytherin credentials and got a Slytherin bobble hat to go with the scarf I got on my birthday – yes, I know, disgustingly sentimental. I am unrepentant!! I had several interesting experience upon a recent visit to London. The first was joining a mass protest outside the Houses of Parliament during the debate on whether the State visit invitation should be revoked. We knew it had already been decided that this would not happen, the government had declared this a week or so earlier, but still, they were duty bound to debate, and as such, I felt duty bound to protest. People say it’s pointless and laugh and jeer at the protestors, but I don’t think so. I’m not usually the protesting type, I don’t like crowds and (this is where my white priviledge shows) I’ve never really had a reason to protest until now. I very nearly joined the #saveourNHS ones but I was, genuinely ill. So, this was my second protest. I took a good long look at myself during the train ride and wondered, why do we do it? Why do I do it, when it seems pointless? The answer I think is a rather more complex one, as anything worthwhile usually is. I protest to exercise my democratic right to make my voice heard, I protest to show I am not okay with what is going on, I protest to show solidarity with those being victimised, I protest so I can look back and say with certainty ‘I tried’. ‘I was not silent’. Even if it changes nothing, even if they ignore us, they still hears us in the chamber, they KNEW that we were not happy. That we were not taking this lying down, and perhaps, parhaps they might in future remember that their people stand for tolerance, respect and the dignity of (wo)mankind, unimpeachable. It might change the minds of one or two, which might eventually swing a vote, have an impact on policy. We tried. We cannot control the outcome, we cannot force or bend people to our will, take direct action, but we will not stay quiet and we will not stay away. More in part two, where I discuss both being on the receiving end of prejudice and my own attempts to combat it at about 0400 with no sleep. Stay tuned! It’s taken a while for me to regroup and work out what I want to say – in fact I’m still not entirely sure. These past few weeks have been trying, both geopolitically and in my own life. 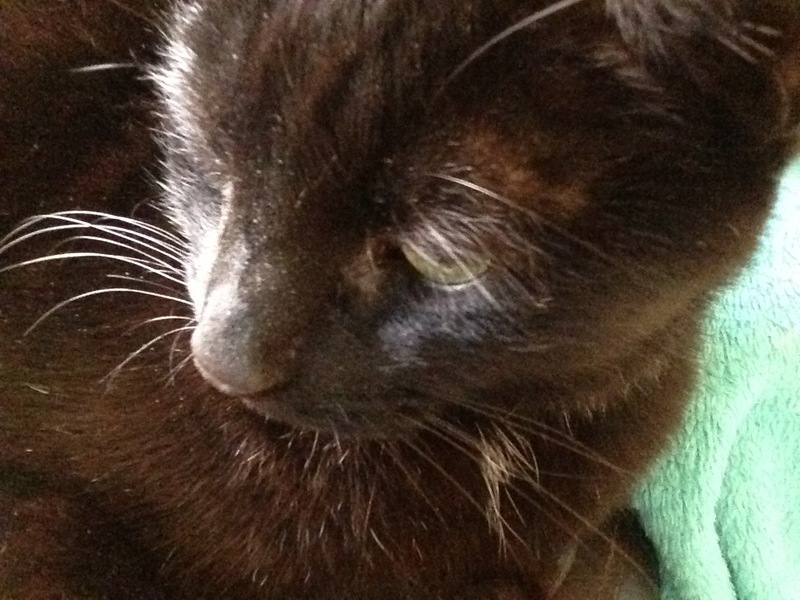 I was spending a lot of time worrying about my cat, who is dying inch by inch as he is in chronic renal failure. He even spent a night in the animal hospital with it, he’s now back to his ‘normal’ but it was touch and go for a week. He was a poorly boy. Then of course, we have the gargantuan cockup that is the US of A, or rather their vitriolic president. I’m half German and obsessed with WW2 and the social constructs that led to the rise of the Nazis (thank you autism) and BOOM. It’s pretty much set and match. 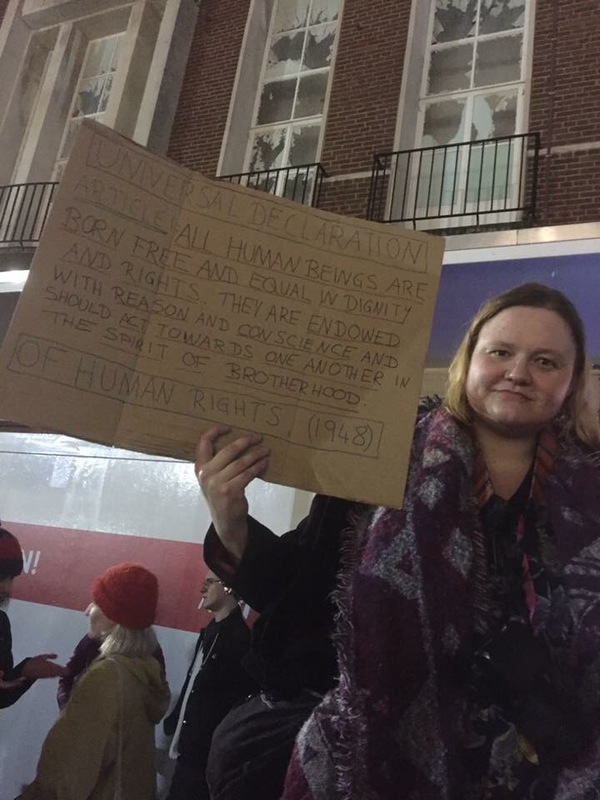 I went and protested, I went and stood up for the Universal Declaration of Human Rights, something I believe in so very passionately. I went to protest the silent acceptance of Theresa May, shame on her. And I went to show solidarity to my fellow citizens of the planet. They laugh about the protest on the alt right. There is a great deal of cynicism. They seem to think we are trying to influence Trump – that’s clearly not the point. We are bringing together and uniting, showing our own political leaders we do not agree and are literally standing up to be counted – we are not silenced. Maybe it will effect something or maybe it won’t, but it’s better than cold cynicism on the internet and trolling. We were loud and peaceful and we made ourselves heard. We were butifully vibrant and diverse in our number and we celebrated humanity. It was quite lovely. So, where to go from here? It’s all well and good, having a nice evening with friends and like minded people in our little liberal bubble, and yes, I should cynical, but I’m not. It was lovely and people were great and we all represented something together – but we need to keep that momentum going. What can I, as one woman do? What can anyone do? Write your local MP, they are there to represent you. If they don’t know, we’ll then, if you don’t ask, you don’t get. Call out xenophobia when you see it, call out racism, even jokes – especially in your own community. Check yourself for prejudice and privilege – those of us who are white, we ARE priviledged by our skin colour – and make sure your brand of activism is intersectional. But do have hard, ideally in person conversations. Facts and figures seem to mean little these days, so we need to change our tactics too – humanise refugees. Connect with the people you’re talking with, find common ground. THIS IS GOING TO BE VERY HARD. Especially if you really don’t agree with the other person’s stance. But we need to break through the barriers to learning, in this case usually extremes of emotion, if we want change. Remember, most of this comes from a place of fear. Don’t be an idiot. Keep yourself safe. Make sure you change passwords and the like regularly. Lock down your social network profiles, make sure your privacy settings are on high. Don’t lose your temper. Don’t become complacent. We will be anaesthetised by outrage after outrage. We will become numb. Keep reminding yourself of what is at stake. This is a long, hard slog, dealing with Brexit, dealing with Trump, dealing with the rise of the right. This won’t be done by Christmas. The consequences will be vast. We will get tired, but, if we don’t keep standing up, who then? I’m going to try so much harder to be active, within the limitations of my health. I do not want this to turn into a dystopian society, it’s up to us to make sure it doesn’t.